The Nuragic civilization, also known as the Nuragic culture was a civilization or culture on the island of Sardinia, the second largest island in the Mediterranean Sea, which lasted from the 18th century BCE (Bronze Age) to 238 BCE when the Romans colonized the island. Others date the culture as lasting at least until the 2nd century CE or possibly even to the 6th century CE. The adjective "Nuragic" derives from the island's most characteristic monument, the nuraghe, a tower-fortress type of construction the ancient Sardinians built in large numbers starting from about 1800 BCE. Today more than 7,000 nuraghes dot the Sardinian landscape. In the Stone Age the island was first inhabited by people who had arrived there in the Paleolithic and Neolithic ages from Europe and the Mediterranean area. The most ancient settlements have been discovered both in central and northern Sardinia (Anglona). Several later cultures developed on the island, such as the Ozieri culture (3200−2700 BCE). The economy was based on agriculture, animal husbandry, fishing, and trading with the mainland. With the diffusion of metallurgy, silver and copper objects and weapons also appeared on the island. Remains from this period include hundreds of menhirs (called perdas fittas)  and dolmens, more than 2,400 hypogeum tombs called domus de Janas, the statue menhirs, representing warriors or female figures, and the stepped pyramid of Monte d'Accoddi, near Sassari, which show some similarities with the monumental complex of Los Millares (Andalusia) and the later talaiots in the Balearic Islands. According to some scholars, the similarity between this structure and those found in Mesopotamia are due to cultural influxes coming from the Eastern Mediterranean. The altar of Monte d'Accoddi fell out of use starting from c. 2000 BCE, when the Beaker culture, which at the time was widespread in almost all western Europe, appeared on the island. The beakers arrived in Sardinia from two different regions: firstly from Spain and southern France, and secondly from Central Europe, through the Italian Peninsula. The Bonnanaro culture was the last evolution of the Beaker culture in Sardinia (c. 1800–1600 BCE), and displayed several similarities with the contemporary Polada culture of northern Italy. These two cultures shared common features in the material culture such as undecorated pottery with axe-shaped handles. These influences may have spread to Sardinia via Corsica, where they absorbed new architectural techniques (such as cyclopean masonry) that were already widespread on the island. New peoples coming from the mainland arrived on the island at that time, bringing with them new religious philosophies, new technologies and new ways of life, making obsolete the previous ones or reinterpreting them. The widespread diffusion of bronze brought numerous improvements. With the new alloy of copper and tin, or arsenic, a harder and more resistant metal was obtained, suitable for manufacturing tools used in agriculture, hunting and warfare. From this period dates the construction of the so-called proto-nuraghe, a platformlike structure that marks the first phase of the Nuragic Age. These buildings are very different from the classical nuraghe having an irregular planimetry and a very stocky appearance. Dating to the middle of the 2nd millennium BCE, the nuraghe, which evolved from the previous proto-nuraghe, are megalithic towers with a truncated cone shape; every Nuragic tower had at least an inner tholos chamber and the biggest towers could have up to three superimposed tholos chambers. They are widespread in the whole of Sardinia, about one nuraghe every three square kilometers. Early Greek historians and geographers speculated about the mysterious nuraghe and their builders. They described the presence of fabulous edifices, called daidaleia, from the name of Daedalus, who, after building his labyrinth in Crete, would have moved to Sicily and then to Sardinia. Modern theories about their use have included social, military, religious, or astronomical roles, as furnaces, or as tombs. Although the question has long been contentious among scholars, the modern consensus is that they were built as defensible homesites, and that included barns and silos. In the second half of the 2nd millennium BCE, archaeological studies have proved the increasing size of the settlements built around some of these structures, which were often located at the summit of hills. 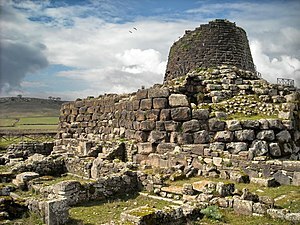 Perhaps for protection reasons, new towers were added to the original ones, connected by walls provided with slits forming a complex nuraghe. Among the most famous of the numerous existing nuraghe, are the Su Nuraxi at Barumini, Santu Antine at Torralba, Nuraghe Losa at Abbasanta, Nuraghe Palmavera at Alghero, Nuraghe Genna Maria at Villanovaforru, Nuraghe Seruci at Gonnesa and Arrubiu at Orroli. The biggest nuraghe, such as Nuraghe Arrubiu, could reach a height of about 25–30 meters and could be made up of 5 main towers, protected by multiple layers of walls, for a total of dozens of additional towers. It has been suggested that some of the current Sardinian villages trace their origin directly from Nuragic ones, including perhaps those containing the root Nur-/Nor- in their name (like Nurachi, Nuraminis, Nurri, Nurallao, Noragugume). Soon Sardinia, a land rich in mines, notably copper and lead, saw the construction of numerous furnaces for the production of alloys which were traded across the Mediterranean basin and nuragic people became skilled metal workers; they were among the main metal producers in Europe  and with bronze they produced a wide variety of objects and new weapons as swords, daggers, axes, and after drills, pins, rings, bracelets, typical bronze statuettes, and the votive bronze boats that show a close relationship with the sea. Tin may have drawn Bronze Age traders from the Aegean where copper is available but tin for bronze-making is scarce; The first verifiable smelting slag has come to light, its appearance in a hoard of ancient tin confirms local smelting as well as casting. The usually cited tin sources and trade in ancient times are those in the Iberian Peninsula or from Cornwall. Markets included civilizations living in regions with poor metal resources, such as the Mycenaean civilization, Cyprus and Crete, as well as the Iberian peninsula, a fact that can explain the cultural similarities between them and the Nuraghe civilization and the presence in Nuragic sites of late Bronze Age Mycenaean, west and central Cretan and Cypriote ceramics, as well as locally made replicas, concentrated in half a dozen findspots that seem to have functioned as "gateway-communities. The late Bronze Age (14th–13th–12th centuries BCE) saw a vast migration of the so-called Sea Peoples, described in ancient Egyptian sources. They destroyed Mycenaean and Hittite sites and also attacked Egypt. According to Giovanni Ugas, the Sherden, one of the most important tribes of the sea peoples, are to be identified with the Nuragic Sardinians. Another hypothesis is that they arrived to the island around the 13th or 12th century after the failed invasion of Egypt. However, these theories remain controversial. Simonides of Ceos and Plutarch spoke of raids by Sardinians against the island of Crete, in the same period in which the Sea People invaded Egypt. This would at least confirm that Nuragic Sardinians frequented the eastern Mediterranean Sea. Further proofs come from 13th-century Nuragic ceramics found at Tiryns, Kommos, Kokkinokremnos, and in Sicily, at Lipari, and the Agrigento area, along the sea route linking western to eastern Mediterranean. Recently the archaeologist Adam Zertal has proposed that the Harosheth Haggoyim of Israel, home of the biblical figure Sisera, is identifiable with the site of "El-Ahwat" and that it was a Nuragic site suggesting that he came from the people of the Sherden of Sardinia. Archaeologists traditionally define the nuragic phase as ranging from 900 BC to 500 BCE (Iron Age) as the era of the aristocracies. Fine ceramics were produced along with more and more elaborate tools and the quality of weapons increased. With the flourishing of trade, metallurgical products and other manufactured goods were exported to every corner of the Mediterranean, from the Near East to Spain and the Atlantic. The huts in the villages increased in number and there was generally a large increase in population. The construction of the nuraghes stopped (many were abandoned or partially dismantled starting from 1150 BCE) and individual tombs replaced collective burials (Giant's Tombs). Around 900 BCE the Phoenicians began visiting Sardinia with increasing frequency. The most common ports of call were Caralis, Nora, Bithia, Sulci, Tharros, Bosa and Olbia. The Roman historian Justin describes a Carthaginian expedition led by Malco in 540 BCE against a still strongly Nuragic Sardinia. The expedition failed and this caused a political revolution in Carthage, from which Mago emerged. He launched another expedition against the island, in 509 BCE, after the Sardinians attacked the Phoenicians' coastal cities. According to Piero Bartoloni, it was Carthage that attacked the Phoenician cities in the coasts, rather than the natives who lived in those cities with the Phoenicians, for the Phoenician cities which were destroyed like Sulky or Monte Sirai which he believes were inhabited mostly by native Sardinians. The Carthaginians, after a number of military campaigns in which Mago died and was replaced by his brother Hamilcar, overcame the Sardinians and conquered coastal Sardinia, the Iglesiente with its mines and the southern plains. The Nuragic culture may have survived in the mountainous interior of the island. In 238 BCE the Carthaginians, as a result of their defeat by the Romans in the first Punic War, surrendered Sardinia to Rome. Sardinia together with Corsica became a Roman province (Corsica et Sardinia), however the Greek geographer Strabo confirms the survival, in the interior of the island, of Nuragic culture even in Imperial times. Bronze sculpture of a Nuragic chief from Uta. Religion had a strong role in Nuragic society, which has led scholars to the hypothesis that the Nuragic civilization was a theocracy. Some Nuraghe bronzes clearly portray the figures of chief-kings, recognizable by their wearing a cloak and carrying a staff with bosses. Also depicted are other classes, including miners, artisans, musicians, wrestlers (the latter similar to those of the Minoan civilizations) and many fighting men, which has led scholars to think of a warlike society, with precise military divisions (archers, infantrymen). Different uniforms could belong to different cantons or clans, or to different military units.The priestly role may have been fulfilled by women. Some small bronzes also give clues about Nuragic personal care and fashion. Women generally had long hair; men sported two long braids on each side of the face, while their head hair was cut very short or else covered by a leather cap. The Nuragic civilization was probably based on clans, each led by a chief, who resided in the complex nuraghe, with common people living in the nearby villages of stone roundhouses with straw roofs, similar to the modern pinnettas of the Barbagia shepherds. In the late final Bronze Age and in the Early Iron Age phases, the houses were built with a more complex plan, with multiple rooms often positioned around a countryard; in the Nuragic settlement of Sant'Imbenia, located by the coast, some structures were not used for living purposes, but for the storing of precious metals, food and other goods and they were built around a huge square, interpreted by archaeologists as a marketplace. The construction of rectangular houses and structures built with dried bricks is attested in some sites across the island since the late Bronze Age. Water management was essential for the Nuragic people, most complex Nuraghi were provided with at least a well; Nuraghe Arrubiu, for example, presented a complex hydraulic implant for the drainage of water Another testimony to the Nuragic prowess in the creation of hydraulic implants is the aqueduct of Gremanu, the only known Nuragic aqueduct yet. During the final phase of the Bronze Age and the early Iron Age Sardinia saw the development of proto urban settlements, with open spaces such as paved squares and streets, and structures devoted to specific functions such as metal workshops, the individual houses were provided with storing facilities and were served by infrastructures. Throughout the second millennium and into the first part of the 1st millennium BCE, Sardinia was inhabited by the single extensive and uniform cultural group represented by the Nuragic people. Centuries later, Roman sources describe the island as inhabited by numerous tribes which had gradually merged culturally. They however maintained their political identities and the tribes often fought each other for control of the most valuable land. The most important Nuragic populations mentioned include the Balares, the Corsi and the Ilienses, the latter defying the Romanization process and living in what had been called Civitatas Barbarie (now Barbagia). The Ilienses or Iolaes (later Diagesbes), identified by ancient writers as Greek colonists led by Iolaus (nephew of Heracles) or Trojan refugees, lived in what is now central-southern Sardinia. Greek historians reported also that they were repeatedly invaded by the Carthaginians and the Romans, but in vain. The Balares have been identified with the Beaker culture. They lived in what are now the Nurra, Coghinas and Limbara traditional subdivisions of Sardinia. They were probably of the same stock from which the Talaiotic culture of the Balearic Islands originated. The Corsi lived in Gallura and in Corsica. They have been identified as the descendants of the Arzachena culture. In southern Corsica, in the 2nd millennium BCE, the Torrean civilization developed alongside the Nuragic one. The representations of animals, such as the bull, belong most likely to pre-Nuragic civilizations, however they kept their importance among the Nuraghe people, and were frequently depicted on ships, bronze vases, used in religious rites. Small bronze sculptures depicting half-man, half-bull figures have been found, as well as characters with four arms and eyes and two-headed deers: they probably had a mythological and religious significance. Another holy animal which was frequently depicted is the dove. Also having a religious role were perhaps the small chiseled discs, with geometrical patterns, known as pintadera, although their function has not been identified yet. A key element of the Nuragic religion was that of fertility, connected to the male power of the Bull-Sun and the female one of Water-Moon. According to the scholars' studies, there existed a Mediterranean-type Mother Goddess and a God-Father (Babai). An important role was that of mythological heroes such as Norax, Sardus, Iolaos and Aristeus, military leaders also considered to be divinities. The excavations have proved that the Nuragic people, in determinate periods of the year, gathered in common holy places, usually characterized by sitting steps and the presence of a holy pit. In some holy areas, such as Gremanu at Fonni, Serra Orrios at Dorgali and S'Arcu 'e Is Forros at Villagrande Strisaili, there were rectangular temples, with central holy room housing perhaps a holy fire. The deities worshipped are unknown, but were perhaps connected to water, or to astronomical entities (Sun, Moon, solstices). Some structures could have a "federal" Sardinian role, such as the sanctuary of Santa Vittoria near Serri (one of the biggest Nuragic sanctuaries, spanning over 20 hectares), including both religious and civil buildings: here, according to Italian historian Giovanni Lilliu, the main clans of the central island held their assemblies to sign alliances, decide wars or to stipulate commercial agreements. Spaces for trades were also present. At least twenty of such multirole structures are known, including those of Santa Cristina at Paulilatino and of Siligo; some have been re-used as Christian temples (such as the cumbessias of San Salvatore in Sinis at Cabras). Some ritual pools and bathtubs were built in the sanctuaries such as the pool of Nuraghe Nurdole, which worked through a system of raceways. The holy well of Santa Cristina, Paulilatino. The holy wells were structures dedicated to the cult of waters. Though initially assigned to the 8th–6th centurie BC, due to their advanced building techniques, they most likely date to the earlier Bronze Age, when Sardinia had strong relationships with the Mycenaean kingdoms of Greece and Crete, around the 14–13th century BC. The architecture of the Nuragic holy wells follows the same pattern as that of the nuraghe, the main part consisting of a circular room with a tholos vault with a hole at the summit. A monumental staircase connected the entrance to this subterranean (hypogeum) room, whose main role is to collect the water of the sacred spring. The exterior walls feature stone benches where offerings and religious objects were placed by the faithful. Some sites also had sacrificial altars. Some scholars think that these could be dedicated to Sardus, one of the main Nuragic divinities. A sacred pit similar to those of Sardinia has been found in western Bulgaria, near the village of Garlo. Starting from the late Bronze Age, a peculiar type of circular structure with a central basin and benches located all around the circumference of the room start to appear in Nuragic settlements, the best example of this type of structure is the ritual fountain of Sa Sedda e Sos Carros, near Oliena, where thanks to a hydraulic implant of lead pipes water was poured down from the ram shaped protomes inside the basin. Some archaeologists interpreted these buildings, with ritual and religious function, as thermal structures. Located in various parts of the Island and dedicated to the cult of the healthy waters, these unique buildings are an architectural manifestation that reflects the cultural vitality of the nuragic peoples and their interaction with the coeval mediterranean civilizations. In fact, many scholars see in these buildings foreign Aegean influences. They have a rectilinear form with the side walls that extend outwardly. Some, like that of Malchittu at Arzachena, are apsidal while others such as the temple of Sa Carcaredda at Villagrande Strisaili culminate with a circular room. They are surrounded by sacred precincts called temenos. Sometimes multiple temples are found in the same location, such as in the case of the huge sanctuary of S'Arcu e sos forros, where many megaron temples with a complex plant were excavated. The largest and best preserved Sardinian Mégara is that called Domu de Orgia at Esterzili. The so-called "giant's graves" were collective funerary structures whose precise function is still unknown, and which perhaps evolved from elongated dolmens. They date to the whole Nuragic era up to the Iron Age, when they were substituted by pit graves, and are more frequent in the central sector of the island. Their plan was in the shape of the head of a bull. Large stone sculptures known as betili (a kind of slender menhir, sometimes featuring crude depiction of male sexual organs, or of female breasts) were erected near the entrance. Sometimes the tombs were built with an "Opus isodomum" technique, where finely shaped stones were used, such as in the giant tombs of Madau or at Iloi. The so-called bronzetti (brunzittos or brunzittus in Sardinian language) are small bronze statuettes obtained with the lost-wax casting technique; they can measure up to 39 cm and represent scenes of everyday life, characters from different social classes, animal figures, divinities, ships etc. Most of them had been discovered in various sites of Sardinia; however, a sizeable minority had also been found in Etruscan sites, particularly tombs, of central Italy (Vulci, Vetulonia, Populonia, Magione) and Campania (Pontecagnano) and further south in the greek colony of Crotone. The Giants of Mont'e Prama are a group of 32 (or 40) statues with a height of up to 2.5 m, found in 1974 near Cabras, in the province of Oristano. They depict warriors, archers, wrestlers, models of nuraghe and boxers with shield and armed glove. Depending on the different hypotheses, the dating of the Kolossoi – the name that archaeologist Giovanni Lilliu gave to the statues – varies between the 11th and the 8th century BC. If this is further confirmed by archaeologists, like the C-14 analysis already did, they would be the most ancient anthropomorphic sculptures of the Mediterranean area, after the Egyptian statues, preceding the kouroi of ancient Greece. They feature disc-shaped eyes and eastern-like garments. The statues probably depicted mythological heroes, guarding a sepulchre; according to another theory, they could be a sort of Pantheon of the typical Nuragic divinities. Their finding proved that the Nuragic civilization had maintained its peculiarities, and introduced new ones across the centuries, well into the Phoenician colonization of part of Sardinia. In the ceramics, the skill and taste of the Sardinian artisans are manifested mainly in decorating the surfaces of vessels, certainly used for ritual purposes in the course of complex ceremonies, perhaps in some cases even to be crushed at the end of the rite, as the jugs found in the bottom of the sacred wells. Ceramics also display geometric patterns in the lamps, in the pear-shaped vessels (exclusive of Sardinia) and the askos. Imported (e.g. Mycenaeans) and local forms were found in several sites all over the island. Also found in the Italian peninsula, Sicily, in Spain and in Crete everything points to a Sardinia very well integrated in the ancient trade of the Mediterranean sea. The language (or the languages) spoken in Sardinia during the Bronze Age is unknown since there are no written records of that period, although recent research suggests that around the 8th century BC, in the Iron Age, the Nuragic populations may have adopted an alphabet similar to that used in Euboea. According to Eduardo Blasco Ferrer the Proto-Sardinian language was akin to Proto-Basque and the ancient Iberian with faint Indoeuropean traces, while others believe it was related to Etruscan. Some scholars theorize that there were actually various linguistic areas (two or more) in Nuragic Sardinia, possibly Pre-Indoeuropeans and Indoeuropeans. The Nuragic economy, at least at the origins, was mostly based on agriculture (new studies suggest that they were the first to practice viticulture in the western Mediterranean) and animal husbandry, as well as on fishing. Alcoholic beverages like wine and beer were also produced, the cultivation of melons, probably imported from the Eastern Mediterranean, proves the practice of horticulture. As in modern Sardinia, 60% of the soil was suitable only for breeding cattle and sheep. Probably, as in other human communities that have the cattle as traditional economic base, the property of this established social hierarchies. The existence of roads for wagons dating back to the 14th century BC gives the impression of a well organized society The signs found in the metal ingots testify the existence of a number system used for accounting among the Nuragic people. Navigation had an important role: historian Pierluigi Montalbano mentions the finding of nuragic anchors along the coast, some weighing 100 kg. This has suggested that the Nuragic people used efficient ships, which could perhaps reach lengths up to 15 meters. These allowed them to travel the whole Mediterranean, establishing commercial links with the Mycenaean civilization (attested by the common tholos tomb shape, and the adoration of bulls), Spain, Italy, Cyprus, Lebanon. Items such as Cyprus-type copper ingots have been found in Sardinia, while bronze and early Iron Age Nuragic ceramics have been found in the Aegean region, Cyprus, in Spain (Huelva, Tarragona, Málaga, Teruel and Cádiz) up to the Gibraltar strait, and in Etruscan centers of the Italian peninsula such as Vetulonia, Vulci and Populonia (known in the 9th to 6th centuries from Nuragic statues found in their tombs). Sardinia was rich in metals such as lead and copper. Archaeological findings have proven the good quality of Nuragic metallurgy, including numerous bronze weapons. The so-called "golden age" of the Nuragic civilization (late 2nd millennium BC, early 1st millennium BC) coincided perhaps with the apex of the mining of metals in the island. The widespread use of bronze, an alloy which used tin, a metal which however was not present in Sardinia if not in a single deposit, further proves the capability of the Nuragic people to trade in the resources they needed. A 2013 study of 71 ancient Swedish bronze objects dated to Nordic Bronze Age, revealed that most of copper utilized at that time in Scandinavia came from Sardinia and the Iberian peninsula. Iron working is attested on the island since the 13th century BC. ^ Miriam S. Belmuth (2012). "Nuragic Culture". In Fagan, Brian M. The Oxford companion to archaeology. 1. Ache-Hoho. Oxford University Press. p. 534. ISBN 9780195076189. ^ Martini, I. Peter; Chesworth, Ward (2010). Landscapes and Societies: Selected Cases. Springer Science & Business Media. p. 169. ISBN 9789048194131. ^ a b Ugas, Giovanni (2016). "Shardana e Sardegna. I popoli del mare, gli alleati del Nordafrica e la fine dei Grandi Regni". Cagliari, Edizioni Della Torre. ^ Rowland, R. J. “When Did the Nuragic Period in Sardinia End.” Sardinia Antiqua. Studi in Onore Di Piero Meloni in Occasione Del Suo Settantesimo Compleanno, 1992, 165–175. ^ Giovanni Lilliu (2006). "Sardegna Nuragica" (PDF). Edizioni Maestrali. Archived from the original (PDF) on 3 March 2012. ^ There is no complete census, but the figure of 7,000 in E. Contu, "L'architettura nuraghica", in E. Atzeni et al., Ichnussa, 1985:5, is often repeated, and 'the Provincia di Cagliari website, estimates more than 7,000. ^ Luca Lai (2008). The Interplay of Economic, Climatic and Cultural Change Investigated Through Isotopic Analyses of Bone Tissue: The case of Sardinia 4000–1900 BC. ProQuest. p. 119. ISBN 978-0-549-77286-6 – via Google Books. ^ "Alberto Moravetti, il complesso nuragico di Palmavera" (PDF). sardegnacultura.it. Retrieved 8 April 2018. ^ Lilliu 2004, p. 362. ^ Lilliu 1982, p. 25-26-27. ^ a b Lilliu 1982, p. 9. ^ The strict patterning in the landscape of tombs and nuraghes was analyzed by Blake, Emma (April 2001). "Constructing a Nuragic Locale: The Spatial Relationship between tombs and towers in Bronze Age Sardinia". American Journal of Archaeology. 105 (2): 145–161. doi:10.2307/507268. JSTOR 507268. ^ Giovanni Lilliu. "Sardegna Nuragica" (PDF). sardegnadigitallibrary.it. Archived from the original (PDF) on 2012-03-03. Retrieved 8 April 2018. ^ "provinciadelsole.it". Retrieved 3 May 2015. ^ Tin as a draw for traders was first suggested in the essay on Sardinian metallurgy by N. Gale and Z. Gale in Miriam S. Balmuth, ed. Studies in Sardinian Archaeology 3 (Oxford, 1987). ^ R.F. Tylecote, M.S. Balmuth, R. Massoli-Novelli, "Copper and Bronze Metallurgy in Sardinia", Historia Metallica 17.2, (1983:63–77). ^ Miriam S. Balmuth, ed. Studies in Sardinian Archaeology 3: Nuragic Sardinia and the Mycenaean World (Oxford, 1987) presents papers from a colloquium in Rome, September 1986; the view of "gateway-communities" from the Mycenaean direction is explored in T.R. Smith, Mycenaean Trade and Interaction in the West Central Mediterranean, 1600–100 B.C., 1987. ^ Pallottino 2000, p. 119. ^ "Paola Ruggeri - Talos, l'automa bronzeo contro i Sardi: le relazioni più antiche tra Creta e la Sardegna" (PDF). uniss.it. Retrieved 8 April 2018. ^ Gale, N.H. 2011. 'Source of the Lead Metal used to make a Repair Clamp on a Nuragic Vase recently excavated at Pyla-Kokkinokremos on Cyprus'. In V. Karageorghis and O. Kouka (eds. ), On Cooking Pots, Drinking Cups, Loomweights and Ethnicity in Bronze Age Cyprus and Neighbouring Regions, Nicosia. ^ Santoni, Vincenzo; Sabatini, Donatella (2010) Gonnesa, Nuraghe Serucci. IX Campagna di scavo 2007/2008. Relazione e analisi preliminare. ^ " Long time archaeological riddle solved, Canaanite general was based in Wadi Ara, Judy Siegel-Itzkovich, 07/02/2010, Jerusalem Post. ^ Carlo Tronchetti. "Quali aristocrazie nella Sardegna dell'età del Ferro? in Istituto Italiano di Preistoria e Protostoria. Atti della XLIV Riunione Scientifica. La Preistoria e la Protostoria della Sardegna, Firenze 2012, pp. 851-856". Retrieved 3 May 2015. ^ "Paolo Bernardini-Necropoli della Prima Età del Ferroin Sardegna. Una riflessione su alcuni secoli perdutio, meglio, perduti di vista (2011)". academia.edu. Retrieved 8 April 2018. ^ Rendeli, Marco. "Il Progetto Sant'Imbenia". academia.edu. Retrieved 8 April 2018. ^ Mossa, Alberto (8 June 2017). "San Sperate (Ca-Sardegna), Via Monastir. Le ceramiche nuragiche del Bronzo recente II e finale: caratteristiche formali ed aspetti funzionali". Layers. Archeologia Territorio Contesti (2). doi:10.13125/2532-0289/2668. Retrieved 8 April 2018 – via ojs.unica.it. ^ Lilliu, Giovanni. "Al tempo dei nuraghi". La civiltà in Sardegna nei secoli. p. 22. ^ Lilliu 1982, p. 109. ^ Quoted by Lilliu 2006, pp. 84–86. ^ Alice Andreoli (2007). "L'armata sarda dei Giganti di pietra". Il Venerdì di Repubblica, July 27, 2007. Rome: Gruppo Editoriale L'Espresso: 82–83. ^ Valentina Leonelli (2012). "Restauri Mont'e Prama, il mistero dei giganti". Archeo. Attualità del Passato (in Italian): 26–28. Retrieved November 21, 2012. ^ "E' in Sardegna il più antico vitigno del Mediterraneo occidentale". www.unica.it. Università degli studi di Cagliari. Retrieved 8 April 2018. ^ a b Montalbano, Pierluigi (July 2009). SHRDN, Signori del mare e del metallo. Nuoro: Zenia. ISBN 978-88-904157-1-5. ^ Giovanna Fundoni. "Le ceramiche nuragiche nella Penisola Iberica e le relazioni tra la Sardegna e la Penisola Iberica nei primi secoli del I millennio a.C." Retrieved 3 May 2015. ^ Ling, Johan; Stos-Gale, Zofia; Grandin, Lena; Billström, Kjell; Hjärthner-Holdar, Eva; Persson, Per-Olof (2014). "Moving metals II: provenancing Scandinavian Bronze Age artefacts by lead isotope and elemental analyses". Journal of Archaeological Science. 41: 106–132. doi:10.1016/j.jas.2013.07.018. Retrieved 3 May 2015. ^ Mossa, Alberto (21 December 2016). "La siderurgia quale indicatore di contatti tra la Sardegna e Cipro: il caso del settore nuragico di Via Monastir di San Sperate (CA)". Quaderni (27): 107–124. Retrieved 8 April 2018 – via www.quaderniarcheocaor.beniculturali.it. Webster, G.S. (1996). A Prehistory of Sardinia 2300-500 BC. Monographs in Mediterranean Archaeology. Sheffield Academic Press. ISBN 978-1850755081. Atzeni Enrico (1981). Ichnussa. La Sardegna dalle origini all'età classica. Milan. AA.VV (1967). La civiltà in Sardegna nei secoli. Turin: ERI. Bernardini, Paolo (2010). Le torri, i metalli, il mare. Sassari: Carlo Delfino Editore. Depalmas, Anna (2005). Le navicelle di bronzo della Sardegna nuragica. Cagliari: Gasperini. Dyson, Stephen L.; Rowland, Robert J. (2007). Shepherds, sailors, & conquerors - Archeology and History in Sardinia from the Stone Age to the Middle Ages. Museum of Archeology and Anthropology. Philadelphia: University of Pennsylvania. ISBN 978-1-934536-02-5. Foddai, Lavinia (2008). Sculture zoomorfe. Studi sulla bronzistica figurata nuragica. Cargeghe: Biblioteca di Sardegna. Laner, Franco (2011). Sardegna preistorica, dagli antropomorfi ai telamoni di Monte Prama, Sa 'ENA. Cagliari: Condaghes. Lilliu, Giovanni (1966). Sculture della Sardegna nuragica (PDF). Cagliari: La Zattera – via Book on line from Sardegnadigitallibrary.it ed. 2008 Illisso. Lilliu, Giovanni (2004). La civiltà dei Sardi dal paleolitico all'età dei nuraghi. Nuoro: Il Maestrale. Lilliu, Giovanni (1982). La Civiltà Nuragica (PDF). Sassari: Delfino – via Book on line from Sardegnadigiltallibrary.it. Lilliu, Giovanni (2006). Sardegna Nuragica (PDF). Nuoro: Edizioni Il Maestrale. ISBN 978-88-89801-11-6 – via Book on line from Sardegnadigitallibrary.it. Melis, Paolo (2003). Civiltà nuragica. Sassari: Delfino Editore. Montalbano, Pierluigi (July 2009). SHRDN, Signori del mare e del metallo. Nuoro: Zenia Editrice. ISBN 978-88-904157-1-5. Navarro i Barba, Gustau (2010). La Cultura Nuràgica de Sardenya. Barcelona: Edicions dels A.L.I.LL. ISBN 978-84-613-9278-0. Pallottino, Massimo (2000). La Sardegna nuragica. Nuoro: edizioni Ilisso. ISBN 978-88-87825-10-7. Perra, Mario (1997). ΣΑΡΔΩ, Sardinia, Sardegna (3 Volumes). Oristano: S'Alvure. Pittau, Massimo (2001). La lingua sardiana o dei protosardi. Cagliari: Ettore Gasperini editore. Pittau, Massimo (2007). Storia dei sardi nuragici. Selargius: Domus de Janas editrice. Pittau, Massimo (2008). Il Sardus Pater e i Guerrieri di Monte Prama. Sassari: EDES. Pittau, Massimo (2011). Gli antichi sardi fra I "Popoli del mare". Selargius: Domus de Janas editrice. Pittau, Massimo (2013). La Sardegna nuragica. Cagliari: Edizioni della Torre. Scintu, Danilo (2003). Le Torri del cielo, Architettura e simbolismo dei nuraghi di Sardegna. Mogoro: PTM editrice. Ugas, Giovanni (2005). L'Alba dei Nuraghi. Cagliari: Fabula editrice. ISBN 978-88-89661-00-0. Vacca, E.B. (1994). La civiltà nuragica e il mare. Quartu Sant'Elena: ASRA editrice. Balmuth, Miriam S. (1987). Nuragic Sardinia and the Mycenaean World. Oxford, England: B.A.R. Webster, Gary S. (2015). The Archaeology of Nuragic Sardinia. Bristol, CT: Equinox Publishing Ltd.
Zedda, Mauro Peppino (2016). "Orientation of the Sardinian Nuragic 'meeting huts'". Mediterranean Archaeology & Archaeometry. 16 (4): 195–201.